On Wednesday April 20th I volunteered with Empty Bowls. In Empty Bowls we create, paint, and glaze bowls. The bowls are later sold to parents and community members for a dinner event. The money made from the bowls goes to charity. In the beginning, we watched a video about the mission of Empty Bowls so that we could understand what we were working for. There were more people than I expected at Empty Bowls: all high school grades were represented. I liked that we all talked as a group rather than separating our conversations by grade. I got to speak with people I would not normally speak with. I have also not had the chance to take more than one art class in high school, and I really enjoyed getting to paint. It was a creative and fun way to spend an afternoon, and I felt good because I was doing service. I hope Empty Bowls continues at Friends after Jack leaves because it is a good organization. 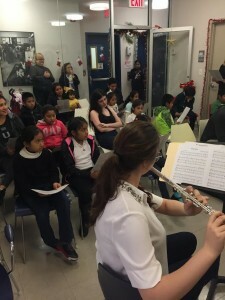 On December 10th, 2015, I volunteered with Music for the Ages, a school-based group that aims to bring music to communities that may not otherwise have access to live classical music. We volunteered at the LSA Family Health Service in Harlem. We played holiday-themed music like Jingle Bells and Sleigh Ride, as well as our repertoire for the Chamber Music Winter Concert. In the beginning the children seemed bored, but by the end they were singing along to the holiday music. They really liked when we played America from West Side Story. Afterward we had a small reception with the children where we got to talk to the kids about music. The children seemed to grow to like listening to the music, and hopefully we inspired them to continue playing music, or pick up an instrument.